"necessary reminder that it's fine to stay the same! you aren't a project to be constantly bettered. it's fine to just *be* in this world - not 'improving', not refining, not getting stronger or healthier, but inhabiting your weird, magical, flawed self fully, just as you are." "i don't think we talk enough about how wonderful it is to have a thread of pure 'you' - unchanging and familiar - that runs through your life. we don't have to be these ever-reinventing, dynamic things. be static, it's great!" 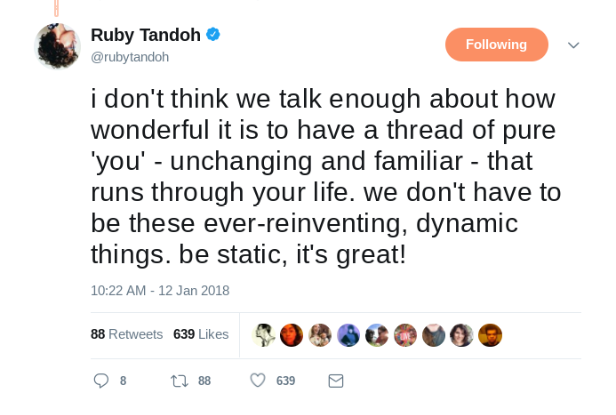 Food writer Ruby Tandoh's tweets made me pause. She's not the first person I've seen to push back on self-improvement culture, or at least pieces of it, whether it's weight loss or meditation or the life-changing magic of tidying up. But her words felt like more radical permission than I'd ever seen to stop reaching and stretching for a better self. Like so many other people who live lives of privilege and relative leisure, I do see myself as a project to be constantly bettered. I take New Year's resolutions seriously, and I make lists of resolutions several other times throughout each year. And I'm turning 30 in a few months, and there are all kinds of self-improvements I want to make before then and in the next year and in the next decade. And there are also vaguer wishes to be a different kind of person: funnier, more quick-witted, more naturally outgoing. Tiny bladder, constantly having to pee. Sensitivity, take things personally, cry easily, especially at movies and TV. Haplessness, social clumsiness, physical clumsiness. Occasionally belligerent sense of justice and fairness. My eyes being bigger than my belly — overfilling my plate, overcommitting, being unrealistic about how many books I can read or what I can accomplish in a span of time. My grandpa told me my eyes were bigger than my belly when I was five or six, and I cried because I thought he meant it literally. Love of absurdity and silliness. Love of singing, frequent fantasies about performing in a band or slaying at karaoke, inability to carry a tune. Shyness and stage fright, but love an excuse to perform and be on stage or on camera. Love of the physicality of books and paper. Good speller, good memory for trivia, love being quizzed. Tendency to end up in awkward situations but never too catastrophic — like how my friend Allison and I were the ones who got lost on a school trip to Disney World and also set off the smoke alarms in our hotel. Or how I once went out with a guy and ended up at a murder mystery party to which neither I nor my date was invited. Pack rat/hoarder of old magazines, any box or package that could be reused, any card or letter I've ever gotten, objects I find on the ground. Messiness, especially in personal spaces like my room, my car, my desk. And honestly, another near-constant is setting self-improvement regimens for myself. I remember writing out a list of commitments like "drink 8 glasses of water and do 20 jumping jacks every day" when I was 12 or 13 (I also read a lot of magazines like Good Housekeeping and Ladies' Home Journal at the time, which may have been an influence). It's good to remember the things I don't need or want to change — not unique or special or trying to charm and impress people, just the qualities of who I am.